How does one summarize a convoluted Pattern that defies common sense? Perhaps, that says it. The Pattern of The Double-Bind is a convoluted, insidious stratagem that turns our mental and emotional common sense world upside down. It is a circular pattern that ends in a vortex of depression and possible suicide. This book is the culmination of a twenty-year odyssey, a personal quest for a solution to an unknown problem that had become emotionally and intellectually intolerable for the author. What she found through trial and error, following threads and connections, was a pattern of behavior that she finally identified and named The Pattern of The Double-Bind. She first discovered it in her Mormon marriage, and then in Mormonism itself. Part I describes The Nature of The Pattern and The Double-Bind; it defines and gives examples of what The Pattern is, how it is used in different stages - and what results are incurred in each stage. Parts II and III present personal experiences of The Pattern in the lives of former members of the Mormon church. The last section, Part IV, gives a Summary of The Pattern and its antidote ... in How to Free Oneself from The Pattern. "Your essays are profound and insightful." "Thank you for publishing your WebPage. 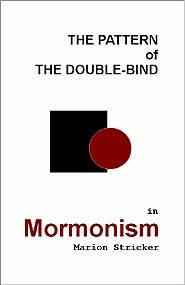 It has helped me intellectually identify what I intuitively know Mormonism is." "I have read the information on your site and found you did an excellent job in describing the impossible."